Camera is one of the very important parts of every smart phone in the world. Everyone wants to click good photos with their mobile. Carrying digital camera everywhere and every time is not possible and a good camera with high range and pixels is always preferred by the users. However, if the top smart phones are observed, then the taking picture from them looks difficult especially for selfie and couple photos. The Xiaomi Bluetooth Wireless RC Self Timer Stretch Camera Monopod with Rotating Clip Stand is one of the most popular and equally useful products to overcome the problem are available in the Gearbest.com. 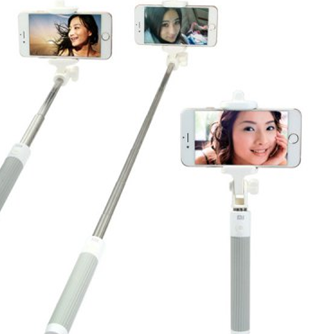 Selfie is one of the most common habits of this generation and with this monopod camera stand, you need not to stretch your arms for taking a photo. This is Bluetooth controlled and you just have to pair the phone with it and then you are ready for a great couple photo without asking anyone. A small and smooth touch on the stand would help you to click a great moment as it can detect your free motion. This is one of the best purchases for the photographers and travelers. The light weight and different extendable sections make it even more appealing. The Xiaomi Bluetooth Wireless stand has in built 55 mAh rechargeable battery and can be rotated at 270 degree. There is also a wrist strap that enhances the security of the monopod. The gear is one of the best for your smart phones and also one of the better iPhone Accessories. It is compatible with IOS 6.0 and above along with Xiaomi 2 and above, iTouch, Samsung Note 5, S6 and many other Android Smart phones. The stand uses Bluetooth 4.0 version and has fast response. If you have the passion for taking photographs then there is hardly anything better than this.